China hasn't ruled out using its status as America's biggest foreign creditor as leverage in the fight over trade. But Steven Mnuchin isn't concerned. "Plenty of people can buy our Treasuries," the US Treasury secretary said in an interview with CNN's Cristina Alesci on Monday at the Milken Institute's annual conference. Treasury securities are "among the most liquid in the world," he said, adding that the market for US bonds is "robust." In March, the Chinese ambassador to the United States kept open the option of scaling back purchases of US debt in the event of a trade war. "We are looking at all options," Cui Tiankai told Bloomberg Television at the time. China is the largest foreign US bond holder with $1.18 trillion in holdings. It's not certain that China would actually dump US debt. Experts say such a move could bring unwanted consequences for the Chinese government, including reducing the value of the bonds it holds on to and even destabilizing its currency against the dollar. 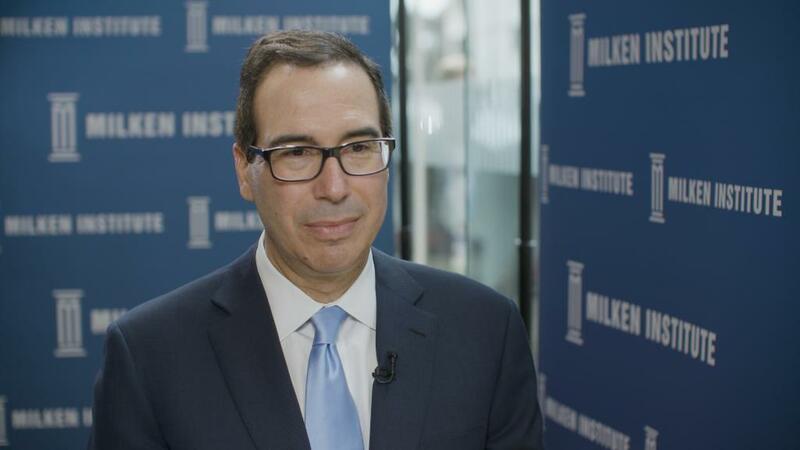 However, the issue could come up later this week when Mnuchin heads to Beijing for trade meetings with government officials. He'll be joined by a number of top US officials, including Trade Representative Robert Lighthizer, Commerce Secretary Wilbur Ross, White House trade adviser Peter Navarro and White House economic adviser Larry Kudlow, the White House said Monday. Mnuchin said that the US team plans to address the trade deficit, as well as a number of issues related to intellectual property theft. But he avoided showing his hand ahead of the negotiations. "I'm going over there for frank discussions and I hope we can make serious progress," he told CNN. In the past, President Donald Trump has said that trade wars are "good, and easy to win." But Mnuchin conceded on Monday that trade disputes are "not easy." "Any negotiation isn't easy," he added. The US has threatened to place tariffs of up to $150 billion on Chinese goods if the two countries can't cut a deal. China has promised to retaliate if such tariffs go into effect. The country has said it would target US products such as pork and soybeans, which would hurt agriculture in many US states that voted for Trump. Mnuchin said the US would support American farmers if necessary. "If China unfairly targets our agricultural community or other areas, we will defend our interests," he said. "We will make sure that they are not unfairly hurt in these trade disputes." In the meantime, Mnuchin said he does not feel that he needs to return from his trip to China with an agreement in hand. "I don't feel any pressure whatsoever," he said. "If I'm going to bring a deal home, it's only going to be a good deal."